Samuel Lawrence Laney was born Wednesday, June 25th. He was 7lbs 13 oz and 19 1/2 in long. He is an absolute sweetheart and Big Sister Ellison is soooo proud of him! He is a very good eater and sleeper! He's growing quickly! Sam can roll over, has 2 teeth, and has gotten his first haircut at home (5 mos) ...the mullet had to go! He has also had his first encounter with a real live Super Hero at his big cousin Brody's birthday party... At 8 months, Sam is sitting up, with no intentions of crawling. He has an extremely loud squeal, and has 4 teeth...he looks like a vampire! 11 months old and MOBILE! He is crawling everywhere and taking a few steps alone. His new trick is wrinkling up his nose. He likes hanging out with his two cousins Aidan and Jolie Kate, and he LOVES the water! 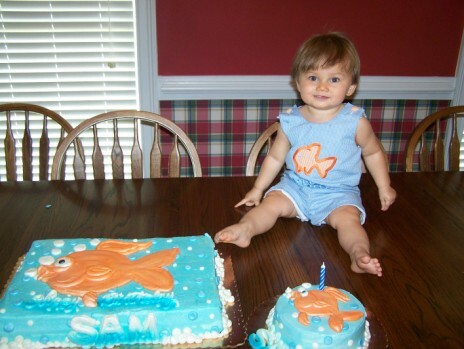 Sam's first year is now complete! I can't believe he's already 1! The year has flown by! He is walking and into everything!! !